As a dog owner, you need to understand not only the physical benefits of exercising your dog but also the intellectual benefit of interacting with them. Dog toys offer a great way to provide mental stimulation of your pet, while also offering more time to spend with your dog to strengthen your bond with them. For dog owners, finding the best dog toy is a daunting task. See, there are many options available for every company terming their toy as the best in the market. However, the truth of the matter is that not every dog toy in the market is of the best quality. That’s why you need to be careful in selecting the best toy for your dog. After all, you don’t want to waste your money buying low-quality dog toys for your canine friend. Nothing is worse than spending your hard-earned money on a toy and having your dog rip it apart in a few minutes. We will make sure you avoid this awful experience by enlightening you on things you need to look into and later give you a list of the high-quality dog toys you can choose from. 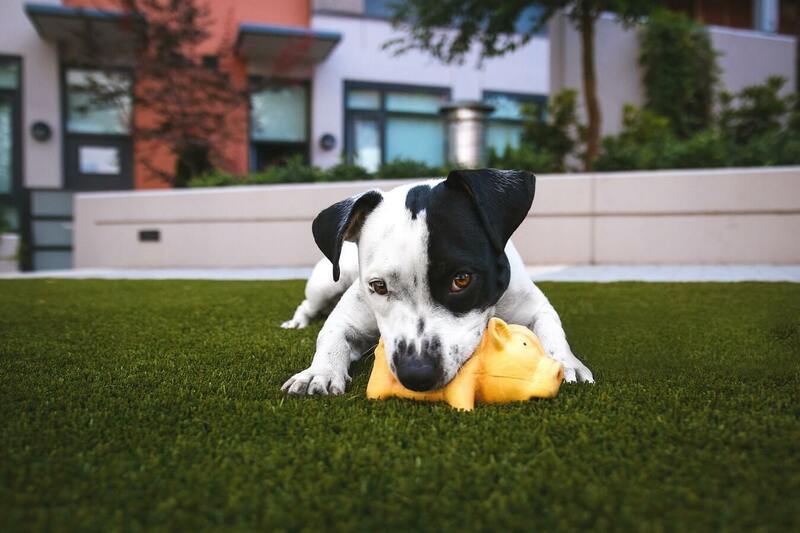 So, before we discuss the factors to consider when buying the best dog toy, let’s look at why you need to invest in one. What Are the Different Types of Toy You Can Consider? The use of dog toys is vital in building a productive, healthy relationship with your pup or dog. The following benefits are the reasons you should invest in the best toys for the dog. If you are looking to develop a stronger bond with your dog, you need to engage them in games and playing. Playing with them will help grow your relationship. By playing with them on a consistent basis, you will be able to share your enjoyment with them. The more you play, the stronger the bond will be. After all, dogs keep seeking their owner’s attention; if you give them that, they will love you. Use this to your advantage and use toys to play with them on a consistent basis. Playing will also lessen the risk of your dog damaging things trying to get your attention. Besides, bonding can extend beyond the owner/dog level: If you have multiple dogs, you can use dog toys to cultivate a bond between them. To reduce the risk of your dog becoming destructive, you need to keep their mind busy. And one way of doing that is by getting mentally stimulation dog toys. These toys are aimed at keeping your dog’s mind active and focused on chewing appropriate things. Without these toys, your dog will get bored. And if you are a dog owner, you know how destructive a bored dog can be. They start getting destructive, disobedient, and can be a nightmare to handle. In fact, by keeping your dog mentally stimulated and active, you will be able to create a healthy relationship with them. Let them use their excess energy by playing with toys rather than engaging in destructive activities. Among the most overlooked aspects of dog, care is dental health. Many dog owners do not prioritize on their dog’s dental health because of one simple reason; brushing a dog’s teeth is not the best task to undertake. However, failure to take care of your dog’s dental health can result in some issues including having bad breath, teeth infection, and malnutrition. Fortunately, dog toy manufacturers have taken this into consideration and have made toys that help your dog’s teeth. These products will help fight against dental issues by encouraging your dog to chew to get rid of plaque on their teeth. This is the most significant benefit of a dog toy; to provide your dog with exercises. Dog’s need a rigorous exercise routine to keep them in top shape. A fun way to make them exercise without tiring easily is by using toys. Instead of letting your canine friend lay on its dog bed all day, why not throw a ball around your home and let them run to fetch it for you. This will help dislodge your dog’s excess energy. Besides, exercises keep your dog from becoming obese. Obesity can cause severe health complications and can impact negatively on your dog’s lifespan. Overweight can also lead to diseases such as diabetes and can also put extra pressure on their joints. See why you need dog toys? They are of great help. So how do you choose the best dog toys? Although dogs do not mature as humans do, you need to keep your dog’s age in mind still. A 4-week puppy will need a softer plush or rubber toy with snug fabrics because he has baby teeth. From 3-9 months, your puppy will be teething, and thus you need to avoid hard rubber. Puppies are known to chew on anything they find around, and therefore it is best to have different varieties of chew toys to keep him distracted from your pair of loafers or slippers. Once they pass the teething phase, your dog will have stronger jaws and teeth to bite harder toys and also will have endless energy to pull rope and play with balls. By seven years, it will be a senior dog and won’t have the same jaw strength and stronger teeth as compared to younger adults. However, it is still essential to give him toys to chew on. However, make sure they have a softer texture. Toys such as sticks and easy-to-toss balls will encourage him to play and thus stay active. Luckily, there are many toy options made for dogs of all ages, and all you will need to do is pick a toy that matches your dog’s age. Also, take into consideration his personal chewing habits as well as his size. Dogs have varying sizes; a Yorkshire terrier cannot handle most of the toys meant for a large German Shepherd- they will need toys considered for smaller dog breeds because of their smaller jaws. Similarly, a toy that has too soft fabric is not suited for a mature dog because it can break into pieces and get ingested. This can cause choking or gastrointestinal blockages. If you notice that a toy has started showing signs of damage, such as having broken squeaker or tearing of its stuffing, it is best to replace it. The right size of the toy is also an essential factor to consider. A toy that is too small can be swallowed quickly. The general rule of thumb is to make sure not to leave anything that can fit in your dog’s rear molars as that is a choking hazard. Ultimately, you will need to decide the types of toys that your dog prefers. Dog’s, just like people, have preferences and choices. And you might need to experiment with different toys to know which ones suit your dog’s more. Even with the above information, navigating the market of toys can still get a bit confusing as you will find different types of toys. As you shop, consider investing in these four types of toys with respect to the age of your dog as well as its size. After understanding the different kinds of dog toys, you will be on your way to finding the perfect and best toy for your dog. These include rubber balls, tennis balls, foam balls, plush balls, squeaker balls, and more. Each of these balls bounces in a different way. Some glow in the dark while others float. For those who prefer nighttime routine, the glowing ball will be best while those who prefer pool games, the floating ball will be just fine. When you find the right size for your ball, ensure that it is made of durable material to prevent your furry friend from tearing it into tiny pieces. Balls also encourage you, as a dog owner, to get involved because dogs love a catch game or game of fetch. This will help in strengthening your bond over time. Most dogs enjoy tug-of-war game with either other dogs or their owners. And although some pet experts may warn against tug-of-war game because of it encourages dogs to be aggressive, there is nothing you need to worry about if your dog is well trained. Perhaps, the most important thing to keep in mind with tug toys is to ensure your dog doesn’t tear them into pieces. Tugs toys are often made of leather, fire hose, rope, or linen and are typically plush. Therefore, it is necessary to replace them as soon as you start noticing missing pieces or damages such as shredding. It is also worth noting that you should not be too aggressive when playing tug of war as well. If you play it rough, you might end up damaging your dog’s teeth, and this could lead to dental issues. If you want him to drop the toy, you need to train him to respond to your commands such as release or drop it. Also, when playing this game, avoid pulling the toy vertically such that you get your dog’s feet off the ground. Although dogs have powerful jaws, you might end up causing them to develop spine or neck issues. Plush toys are one of the favorite toys for dogs. However, they are unsafe most of the times because they are easy to rip apart and ingest. However, they can be fun when a dog plays with them under supervision. Before your pup enters the teething phase, you can get the plush toys to snuggle up with at night. If you notice they are your dog’s favorite, don’t write them off. Make sure they play with them under supervision. Whereas balls and plush toys can chew toys, there are toys explicitly made for chewing, and it is best for dental health. Typically made from hard rubber material or nylon, these toys are built to last. Some have areas to help you stuff them with treats for training while others offer long-lasting entertainment. They are soft enough to chew with no risk of causing teeth breakages but durable enough, so they don’t tear apart easily. As your pup matures, you will have to change the size of the chew toys you buy them. Ensure you are stuffing healthy treats in your toys to keep your dog extra healthy while keeping him entertained and active. Choosing the best dog toys will ensure great, fun play time. You can use them to train your dogs as well. Remember to select a dog toy based on their size, age, and intensity of their chewing habits. Comes in classic flavors that your dog will love. The Benebone dog toy is a must-have for your dog as it has a wonderful smell that your dog will find hard to resist. The shape allows for a good bite, and the toy is durable. Most dog owners who have this dog toy are glad. The Chuck-it Ultra Ball is chew proof as the material is flexible and sturdy at the same time. A few customers reported that their pets did not like the ball. If your dog is an aggressive chewer, the Chuck it! Ultra Ball could be your ideal dog toy. At a glance, this may appear like a regular tennis ball, but the ball is durable and can bounce very high for a better experience. This is an indestructible dog toy that’s not only durable but also offers an ultimate experience to your dog. It’s an ideal choice for keen swimmers and aggressive chewers. Better yet, in case your dog destroys the outer layer, the company offers a time replacement for the ring hence you can try it without worry. Unlike most dog toys, this one is BPA free, and so you can leave your dog to play with it, without the need for supervision. Not only that, the manufacturer stands behind its quality by offering a 100% guarantee. It is the US made and should be durable. Need a dog toy that can challenge your dog to keep his intellectual level up? This toy does so by offering intellectual stimulation. Your pup is sure to love this interactive toy which is durable and reasonably priced. For people who don’t have much time to take the dog for a walk, this a good toy to offer mental and physical exercise to them. It’s indestructible and has been made with durability in mind having been made in the US. For food-motivated dogs, they will find this toy entertaining for a long time. Additionally, it doesn’t dispense food easily and is hard to chew. Most owners have praised this toy as durable and entertaining to their dog. Duckworth is among the best dog toys for puppies and adult dogs as they can play, fetch and cuddle with this friendly duck that squeaks. The toy is large and plush filled and is less likely to cause hazards. It’s durable yet less costly which is why it has been a favorite for dog owners who already have it. May not be ideal for dogs with over 30 lbs. This toy is sure to keep your dog physically fit and mentally stimulated for longer periods. Better yet, it is made of tough material to ensure durability. As if that’s not enough, the company offers a lifetime guarantee that your dog will love playing with the toy. Otherwise, the company offers a 100% money-back guarantee in case your dog does not love it. Most dogs find love these as it offers hours of fun along with unique sounds. Even for aggressive chewers, these are soft and easy to squeeze yet indestructible. They are reasonably priced and have received a lot of praise on Amazon from dog owners.